What are the Right Type of Gloves for Me? What are the right type of boxing gloves for me? That depends on what you are primarily using them for. It’s also largely dependent on personal preference. Some people prefer smaller, more compact gloves, while others are more interested in hand protection and like a more heavily-padded glove. Fit is also a large factor. Just like all people are built differently, everyone’s hands are unique. One glove may fit a person perfectly, but another doesn’t contour to the shape of their hands the same way. The main thing is to choose gloves that fit comfortably, feel right and don’t force your hand into any position that is unnatural. This will achieve goal #1 and, that is, that your hands are fully and properly protected. In the end, though, what really determines what glove is right for you is what are you intending to use the gloves for. There are essentially three types of boxing gloves, aside from those used for competition. This will help you figure out which gloves you really need. BAG GLOVES These are primarily used to hit the heavy bag, double end bags and other specialty bags. They typically feature a wrap-around closure for ease of putting on and taking off. In many cases, they’re also constructed with a heavier, dense foam, for protection of your fists when hitting a harder heavy bag. These are not the type of gloves you would use for sparring or hitting other boxers, because they don’t have as much resiliency or “give” as sparring gloves. SPARRING GLOVES These are used for making contact with other fighters, replicating a fight scenario by squaring off against a chosen partner during your workout. The best gloves for sparring have laces or have a design that covers the wrap-around closure so that neither fighter gets cut or abrasions from the hook and loop fastening system. Sparring gloves are usually measured in ounces. Although there’s no hard and fast rule, fighters who weigh between 100-126lbs should be sparring with gloves that weigh 12 or 14 ounces. Fighters who are in the 126-160 lb. range should be in 14 or 16 ounce gloves. Any fighter over 160lbs should choose 16 or 18 ounce gloves. This affords optimal protection for your sparring partner and adequate hand protection. The larger the ounces, the greater the shock absorbency provided. TRAINING GLOVES These are, sort of, a hybrid glove that can be used for sparring or bag work. They are typically firm enough to use on heavy bags, but also absorb enough shock to wear while sparring. However, it’s not recommended to use the same glove for bag work and sparring. The texture of the heavy bag roughens the punching surface of the glove, and the hardness of the heavy bag also wears down the padding. Overall, the quantity of punches you throw on a heavy bag breaks the glove down and reduces its effectiveness as a sparring glove. Training gloves are a great option if you’re unsure of what you want to use them for, but once you’ve decided to spar in them or hit bags with them, we recommend sticking with that ONE, intended use. Having said that, if you still choose to buy one style of glove and use it for both sparring and bag work, a training glove is your best option. Do ounces affect the size of the glove? In most cases, yes. Gloves that weigh less typically have a smaller hand compartment, especially in terms of sparring and training gloves. Lighter gloves are intended for lighter weight fighters. The greater the ounces, the more padding and protection. Can I use any gloves for bag work? You can do bag work with almost any type of boxing gloves, but if they were not meant to perform as bag gloves, the leather (or outer materials) and foam padding will likely break down faster. The volume of punches you throw on a heavy bag are not nearly as many as you throw in sparring, so the added use will shorten the life of the gloves. Can I use bag gloves to spar with? You can do anything, but you shouldn’t use bag gloves, that are typically heavier, more densely padded and harder, to make contact with other fighters. Having two separate types of gloves to train with may seem more expensive, but actually they will each last twice as long if you use them only for their intended use. What gloves are best if I have hand problems? The more padding, the better, so choose large ounce gloves for everything you do in the gym. Proper hand-wrapping and knuckle guards will also help provide additional protection and absorption of impact. What is the difference between lace up gloves and those that have a wrap-around closure? Safety, convenience and fit. The wrap-around style glove is easy to put on and take off. 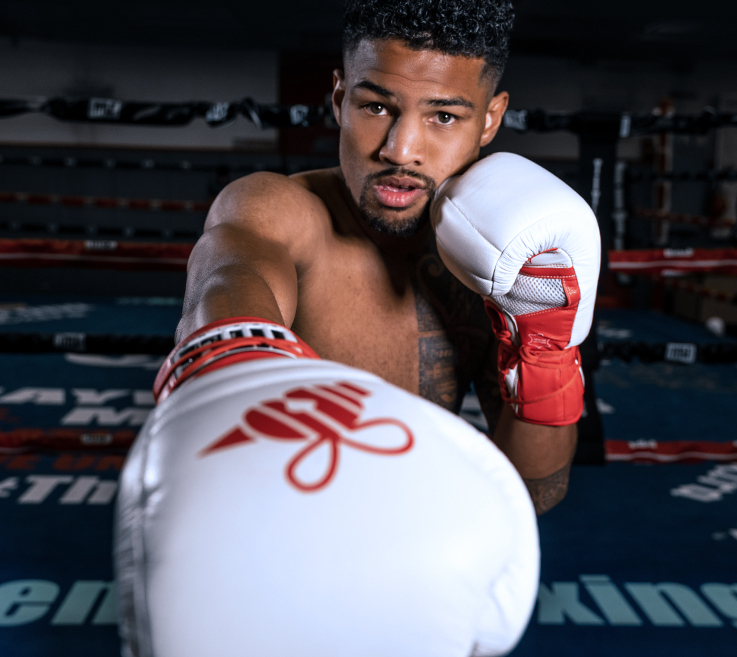 As long as it’s designed for sparring, with hook and loop covering or “channels” that hide the hook and loop, wrap-around gloves are great for any training situation. Lace-up gloves are simply more traditional and, in some cases, can provide a more secure, custom fit. Does one glove suit my boxing style better than another? It can. If you’re a natural boxer and your game is dependent on speed, don’t buy boxy bag gloves or ones that carry all of their padding in the knuckle area. You likely focus more on speed and don’t need wide or overly padded gloves to slow you down. Your style doesn’t lend itself to power punching anyways, so the extra foam and padding isn’t really as necessary for you. On the other hand, if you’re a heavy-handed KO artist, look for gloves that are thickly padded across the knuckles and the back of the hand. Plus, pay special attention to lacing-up or putting your gloves on. A more custom, snug fit will help prevent the gloves from slipping, hitting incorrectly and will provide a more secure weapon. Do I have to wear hand wraps? If you’re serious about your profession, yes. As a boxer, your hands are one of your most valuable assets and should be protected at all costs. This is not an area to cut corners to save time. Always wrap your hands and secure all of the bones in your fist properly. Is there anything I can do to prolong the life of my gloves? Regardless of what type of glove you end up choosing in the end, one of the most important aspects to remember is that you properly care for them. In order for your gloves to perform as well and as long as you want them to, you need to spend some time maintaining them. When you’re done using them, wipe off any excess sweat, oils or dirt.These contaminants break down the leather/materials and foam that gloves are made out of. Store them in a cool, dry place. Don’t leave them to mildew and form bacteria in a closed-up, humid gym bag. It even doesn’t hurt to periodically use a mild lubricant or leather cleaner to keep them supple. Leather can dry out and crack and shortens the life of your gloves. Hockey great Wayne Gretzky was once quoted as saying, “I don’t like my hockey sticks touching other sticks, and I don’t like them crossing one another, and I kind of have them hidden in the corner. I put baby powder on the ends. I think it’s essentially a matter of taking care of what takes care of you.” What a perfect philosophy, no matter what sport you’re talking about. That’s approaching it professionally. Also, wash your hand wraps regularly. The cleaner you keep them, the longer they will protect your hands, help absorb sweat and keep your gloves from getting stinky. They’re your first line of defense in making your gloves last longer. Buy the right gloves here.